Horn Corals are from the extinct order of corals called Rugosa. Rugose means wrinkled. The outside of these corals have a wrinkled appearance. Horn Coral grows in a long cone shape like a bull’s horn. 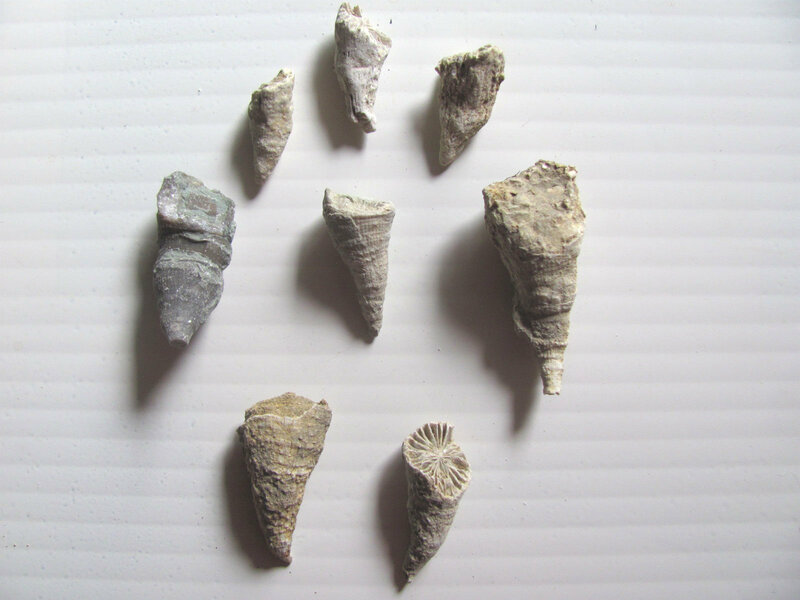 The fossil is the skeleton of the coral animal or polyp. They built these cone shaped structures from calcium carbonate that came from the ocean water. The animal lived at the top of the cone. As the animal got bigger it added more material to the cone. Each layer was a little bigger than the previous one. All corals belong to the phylum of animals called cnidaria. They are related to jellyfish which are also cnidaria. While modern corals are colonial the now extinct horn corals could be colonial or solitary animals. They had many tentacles sticking out to gather food. The tentacles gave them a flower like appearance. The oldest of the Rugosa corals are found in rocks from the Ordovician Period. Many species evolved during the Paleozoic Era. As a group they flourished until the Permian Period when they became extinct along with most living things during the Great Permian Extinction.